Do you need a reversible door? Do you need a locking door? With spaces getting smaller, mini fridges are seeing a surge in popularity. They’re perfect for small spaces at home, at the office or even in the RV. Whether you want one for your dorm room, garage or media room, the need to maximize space is ever increasing and people want more out of this compact and multi-purpose alternative. The most popular use for the mini fridge is the dorm room, making back-to-school shopping a popular time to snag some deals. These small refrigerators are also widely used in the office, RV, garage and, as the population ages, to store medications and other temperature sensitive or medical materials. With so many models and brands available, whatever your purpose and space consideration, there is a mini fridge that will fit your needs. One of the smallest cube fridges available. It is CFC-free and boasts an adjustable thermostat, a 2L bottle holder on the door and due to the compressed cooled mechanism can keep performing at an optimal range regardless of the outside temperature. Some of the features include a reversible door, a space-saving back design and an ice cube chamber with tray. The compact size is convenient for dorm rooms, under desks, counter tops and any other small spaces. With a price tag under $100, this makes it an affordable option for cooling drinks and snacks. The small freezer compartment is large enough to hold single-portion frozen meals and the door basket is a convenient feature for keeping your 2L bottles upright after opening. The placement of the temperature control dial at the back of the mini fridge can be a bit annoying to reach to adjust the controls and this mini fridge has been known to be a bit noisier than expected. It is good at keeping a few items cold but not meant for any heavy-duty cooling or the long-term storage of perishable foods. A sturdy little cube for the smallest of spaces. If affordability is a concern, this unit is a balance between price, size and quality. 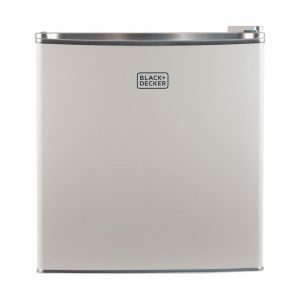 This Energy Star certified mini fridge has everything you would want in a compact package, an attractive white finish to coordinate perfectly with any décor and door storage, including space for a 2L bottle are included. The freezer is a full-width built-in compartment that can hold an ice cube tray and ready-to-eat frozen meals. It also has an adjustable, removable shelf for easy cleaning. Under $100 and certified energy efficient, a little goes a long way with the cube. The lightweight and compact design make it easy to transport wherever you may need it and whisper quiet motor will also make it a subtle addition to any small space or room. It has an attractive look and keeps items like yogurt cups, lunch meat, pop and snacks reliably cold. The door features a wire bar that holds your beverages in place to avoid spillage and mess. It has trouble freezing ice cubes from still water. The freezer compartment is quite small and can only fit a single frozen entrée or ice cube tray. The adjustable shelf can impact the storage space available but can be removed if it interferes. 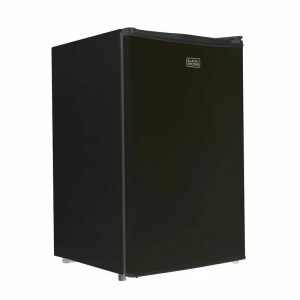 Overall, for the price and the size, this cube mini fridge performs admirably. Use it for dorms, counters and even beside the couch during the game. This mini fridge can cool quickly and will be a reliable choice for snacks and beverages. While it is not recommended to store raw meats, it does quite well with cold cuts and leftovers. Perfect for those care packages and leftover dinners from home. This mid-sized 3.2 cubic feet refrigerator and freezer combo comes in a variety of fun and attractive colors. If you are looking to add some pop to a room instead of the usual appliance colors, this is your choice. It comes in 7 bright colors that will complement any décor from the dorm room to the play room. 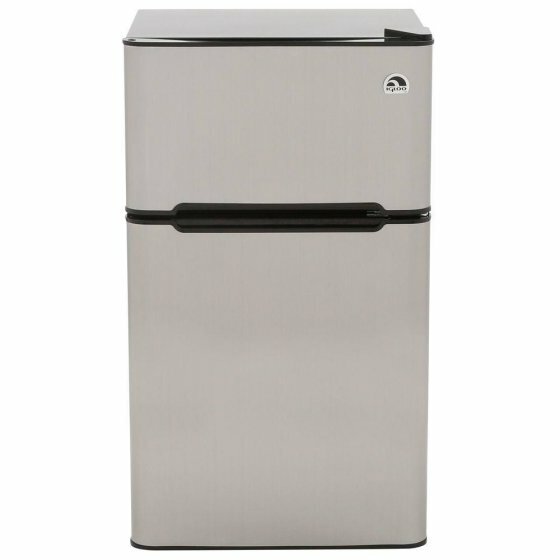 This mini fridge has the convenience of a reversible door and adjustable lever feet making placement effortless. The slide out shelving are a breeze to clean and the adjustable thermostat offers choice and convenience with your food storage needs. It also features an interior light and a crisper. The interior is designed to maximize storage space with can dispensers and moveable shelving. The flush-back design and invisible door handle allow it to slide into your space with ease. Is capable of freezing ice cube from still water. The interior light is a great little feature for those midnight snacks. Can run a little hot at the back. It is a good practice to leave a little space between the wall and this mini fridge. The “stainless steel” model is simply grey in color, achieving only the look of stainless steel. This model runs reliably and is capable of freezing ice, but the biggest draw is the bright colors it comes in. Bright and fun, they are attractive for young, casual spaces. Overall, this is a great space-saver and a reliable choice of mini fridge. It can freeze, cool and store perishables with ease and holds a wide variety of items. 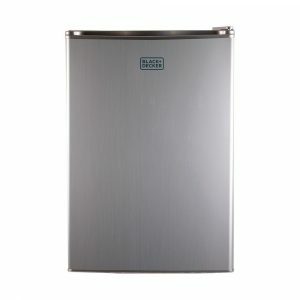 This space-saving mini fridge is Energy Star certified and features adjustable thermostat control. There is a crisper compartment, and full-width removable shelves that allow you to customize the space you need for storage. Unlike its 2-door counterpart, this mini fridge has a built-in freezer compartment which allows for a high fridge-to-freezer ratio for those who prefer to refrigerate rather than freeze. It offers a reversible door, and leveling legs to find the perfect fit wherever you put it. 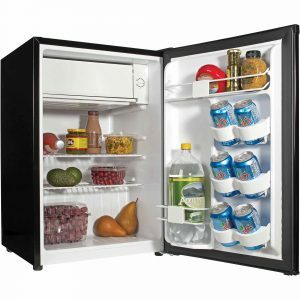 The reversible door is a practical feature for those who don’t have a set place in mind for the mini fridge or who wish to move it to various locations. It has reliable cold distribution and can get to freezing temperatures easily. This model is very quiet and unobtrusive in any room. Perfect for your home, office or games room. It has an automatic defrost function so it shouldn’t gather ice and require you to shut off the entire fridge to defrost it, like the ones that do not have that feature. The built-in freezer can cause the top shelf to become too cold and can lead to frozen items outside of the freezer. It can at times become too cold if the temperature isn’t monitored. This is a reliable model that cools quickly and efficiently. It has a very roomy interior for a unit of its size and the adjustable shelves and unique storage options means it will easily customize to your needs. This model is a slightly smaller version of the BLACK+DECKER BCRK32V Compact Refrigerator, 3.2 Cubic Ft., featured in this article. Still in the mid-sized range but on the more compact end of the spectrum for those who want the space of a mid-size but with a smaller footprint. This model has a dispenser for 5 12oz pop cans, manually defrosts, a full-width freezer compartment, a reversible door option and an adjustable thermostat control. This mini fridge holds more than it claims to. It has a roomy interior and can fit more drinks, if placed on their side, than advertised. This mini fridge cools efficiently and quickly and holds the temperature evenly, which means it is safe to use with fresh meats and eggs. There have been complaints of a “crackling” noise being heard with this model, which would not be too much of a concern for a noisy games room setting. The freezer compartment is too small to hold a standard size ice cube tray but can fit a “travel” size tray instead. 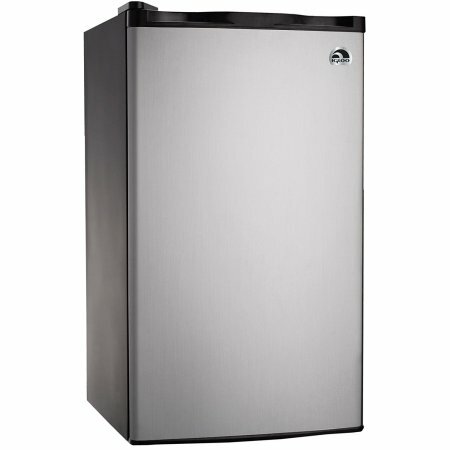 This is a good option for those who need more room than a cube fridge but do not have the space for a larger mid-sized option. It holds its temperature and has a smaller footprint than similar models without sacrificing interior storage in a major way. This mini fridge is on the large side of the mid-size spectrum, so it can afford to have a few more bells and whistles than its counter-parts. Though larger in size, it remains in the same price range, under $200, as smaller units in the same category, which makes it a worthwhile investment if you have the space for it. This model has low energy consumption yet is not Energy Star certified. It comes with a dairy rack, food rack and bottle rack. Removable food shelves, drip tray and adjustable thermostat. It is CFC-free and has a built-in freezer compartment. It comes at an attractive price-point for the size of the mini fridge. The reversible door makes it versatile and easy to place. No interior light makes it hard to see the contents. The freezer is on the small side and the door may not be as tightly secured as other models. This is a value for money purchase. 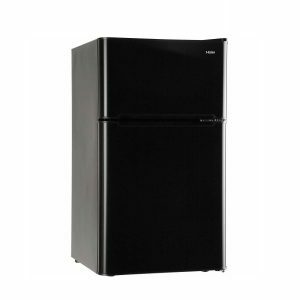 The mini fridge works well and keeps things evenly cold, but the price can’t be beat for the size of the mini fridge. 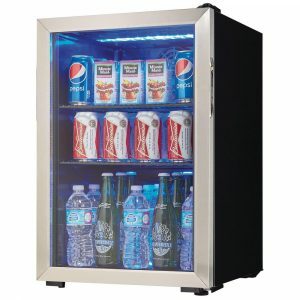 It is a fantastic choice as a beverage fridge and uses minimal wattage to run. It can freeze ice and performs well to cool items quickly and evenly if the thermostat is set on the lower settings. It is a sensible choice for a dorm room or a price-conscious consumer. This mini fridge specializes in organization. It features a 6 can dispenser and numerous shelves on the door. The capability to hold a 2L bottle. It includes a crisper that holds in moisture to keep produce fresh for longer and 3 glass sliding shelves. The freezer is small, but the mini fridge space makes up for it. It also has an adjustable thermostat, reversible door and levelling feet for uneven surfaces. It has an excellent lay-out and organizing capabilities. This mini fridge is quiet and energy efficient. It comes in at a fair price point and has a roomy interior due to the way the shelves are arranged. It is a solid design with no major flaws, something that is hard to find in any search for a quality product. The freezer is very small. It can probably accommodate a few ice cream bars or a ready-to-eat frozen dinner, but not both. The black and decker logo is also quite prominent. Conclusion: This mini fridge has a little bit of everything. It is energy efficient, has a large storage area with plenty of shelving options and a freezer large enough for a few frozen treats. It runs quietly and is small enough to fit into tight spaces and small rooms. It is a sound choice as a mid-size mini fridge. Unlike other units, this boasts the ability to store 2 full-sized ice cube trays in its freezer compartment. It also has adjustable plastic shelving. Wire racks on the door to secure larger bottles and a can dispenser. It is low energy and CFC-free so if efficiency and the environment are your priority this will help achieve that goal. This mini fridge can accommodate a full head of lettuce, small containers of milk, sodas, condiments and is cold enough to safely refrigerate fresh meat and fish. It is roomy without taking up a vast amount of space. In addition to which, it is whisper quiet and runs on low wattage to save on electrical costs. The freezer is not the strongest or the largest. If freezing is a main feature in your search, this wouldn’t be the model for you. The shelves are not glass and may be flimsier than their glass or wire counterparts, which could produce sag over time. Conclusion: This is a quality mini fridge at a reasonable price, but it lacks in the freezer department. If that isn’t a selling feature for you, the available space in the refrigerator portion will more than make up for it. This is a fridge for people who are looking mainly for a smaller version to store actual grocery items beyond drinks and snacks. A prudent choice if you have roommates or just not enough fridge space in your main refrigerator. Keep your roommates away from your ice cream bars with this little dream mini fridge. It comes with a separate freezer that can hold ice cream, frozen entrees and of course, ice cube trays. This little fridge packs everything from a standard fridge into a compact size. It features a 2-door configuration, pull-out glass shelves, an adjustable thermostat and compressor cooling. It has a built-in can dispenser, can hold a 2L bottle in the door and has removable produce crispers. It is quiet and cools quickly. 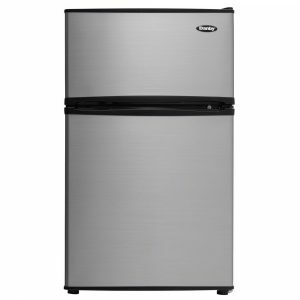 The size is perfect for a studio-sized apartment or office and the freezer is ample for the size of the fridge. It is light and easy to move, considering the size, and can be put in a bedroom or other small space. The can dispenser on the door has been known to interfere with storage space if you don’t use the mini fridge for pop. It can get a bit too cold and freeze some of your produce, but the temperature is adjustable. It can be less energy efficient than other similar models. 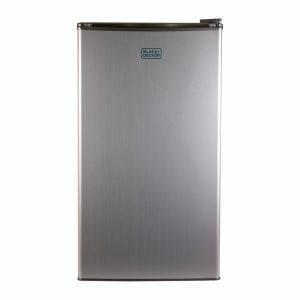 This mini fridge is an excellent choice for those who crave more space and a more powerful freezer. This size can accommodate fresh food and leftovers for longer periods of time, as well as milk cartons, and other full-sized beverages, yet it is still small enough to fit in out-of-the-way and tight spaces. The whisper quiet motor won’t interfere with sleep or concentration should it be placed in dorm rooms or bedrooms and workspaces. 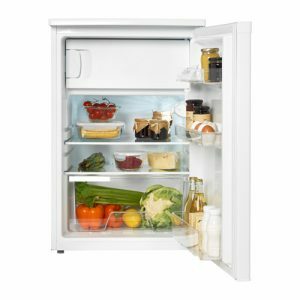 A 2-door fridge may be a bit costlier than it’s one door counterpart, however for those serious about freezer space it is the best available option in compact fridges. This model has a large freezer with room for more on the door, 2 removeable glass shelves and a crisper for fresh produce. It can hold one or more 2L bottles and has a can dispenser on the door. It has an impressive amount of space for such a compact fridge. Although it is a lesser known brand, it still stands up in quality and size. The freezer compartment is large and can fit several frozen items. The fridge has the space to put more that just snacks and can accommodate fresh foods as well. It is a suitable choice for people who rely more heavily on frozen foods and want the convenience of being able to store them reliably in an even temperature. If you don’t use cans or bottles, the storage on the door might be a bit stifling. The door storage is really designed for beverages and not much else. Drinks inside the mini fridge must be placed on their sides to properly fit unless one of the shelves is removed. Conclusion: The right choice for people looking to store more frozen items than refrigerated ones. This brand and model is at a lower price point than its competitors and that might make all the difference in the selection process. Believe it or not, there are many different types of mini fridges on the market. Some are perfect for small spaces, while others offer more permanent solutions. They can range in weight from 25lbs to over 75lbs, something to consider when thinking about the portability of mini fridge you wish to purchase. Cube Mini Fridge: The cube refrigerator is the most common mini fridge, perfect for a small dorm room, under a desk at work or even on a counter for some extra food storage space. 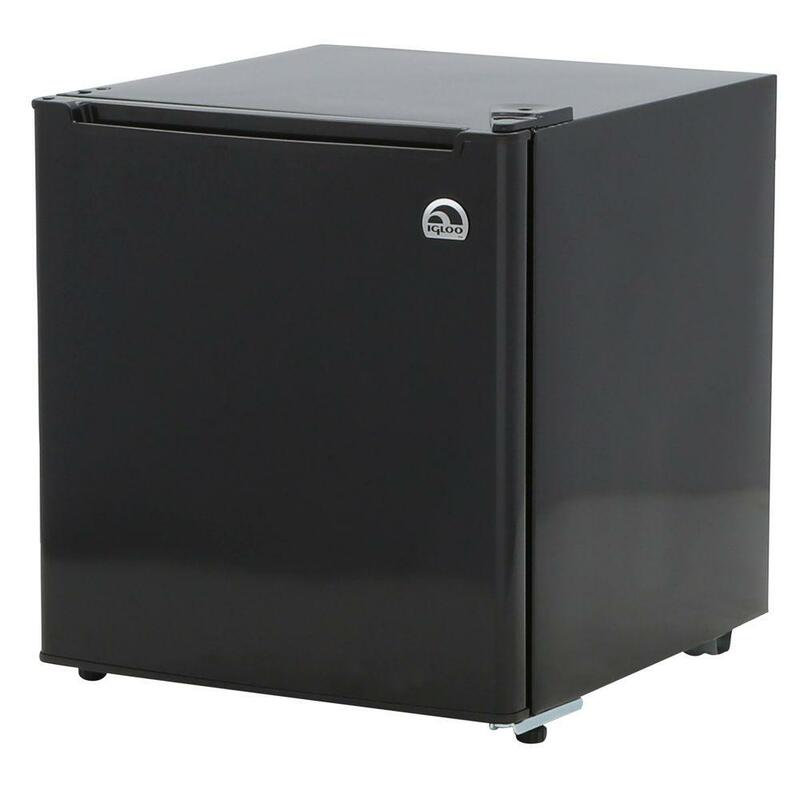 The cube fridge can range in size from 1.5 to 2.1 interior cubic feet and can weigh anywhere between 25-30 lbs., which makes them a good portable choice. The drawback of the cube fridge though, is that it is not efficient due to poor insulation and it cannot cool much more than some drinks, and snacks and like its name suggests, it is as deep as it is wide, which may be a problem if looking to store it under or on a desk or counter. The space should be measured carefully for depth. Mid-sized Fridge: The mid-sized fridge is usually a little more expensive than the cube, but it can store more. They generally range in size from 2.7-4.7 cubic feet. These fridges come with more shelving, a larger freezer compartment and sometimes adjustable temperature controls. They use less energy and are over-all more efficient to run. These fridges can even accommodate full-sized grocery items. Counter height: The counter height mini fridges are simply larger, usually more than 5 cubic feet in size. They have more freezer and shelf space, they contain crispers and are basically the “condo-sized” version of a standard fridge. They have more even temperatures and can be trusted to keep fresh meats at the correct temperature, which is 40°F by law to avoid bacterial growth. You can choose models that feature interior lights, separate freezers or simply a fridge without the freezer option. 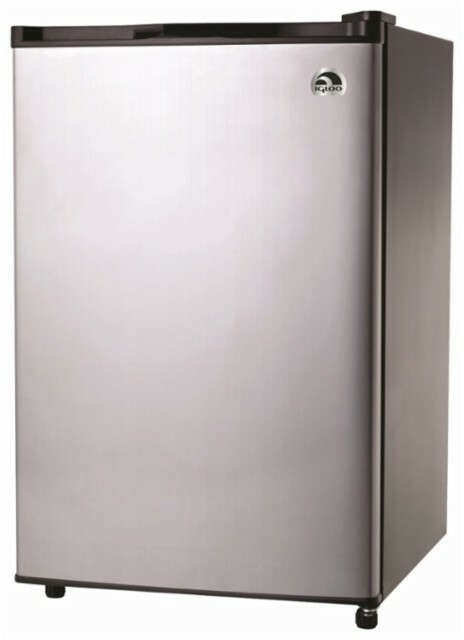 2-door Mini Fridge: This type refers to the separate freezer compartment. Some of the larger mini fridges have this option. They can feature an auto-defrost or several removable shelves and temperature controls to avoid any unwanted freezer burn due to uneven cooling. The separate freezer compartment is usually quite a bit larger than the freezers contained within the 1-door models and act almost exactly as the freezer in a standard-sized fridge. The 2-door freezers can hold substantially more items the freezers contained in the 1-door units. Thermoelectric: is plugged into your car but puts quite a strain on the battery. They are meant for short distances and can be loud. Compressor: works the same way that a regular mini fridge works. It is also plugged into the car battery but uses less power. This type is only good for drinks or snacks as it has trouble keeping an even temperature over the longer trips. Absorption: it is quiet and has no motor because it uses liquid ammonia that evaporates into gas to cool the food. It still requires a power source though and must be kept level at all times to avoid an ammonia leak. It is the preferred choice for remote areas where there isn’t electricity since it can be powered by a gas or small portable generator. 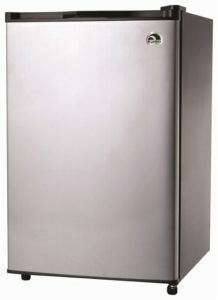 The capacity of a mini fridge refers to the interior size of the model. It is usually listed in cubic feet anywhere from 1.5 to 5+ cubic feet in volume. Sometimes the manufacturer will list the types of items the fridge can hold, such as a 2L bottle or how many pop cans for reference. The size however can vary from the little cube all the way to the counter height, commonly used as the main fridge in small spaces such as studio-sized apartments. It is best to know not just the height and width of your space, but also the depth since some mini fridges may extend beyond counter-depth and may not fit into a shallow space. There are two main types of freezer compartments in mini fridges: one that is within the interior space of the fridge and the other, which is separate, like a standard-sized fridge. If you are looking to keep more than just ice cubes frozen, the separate freezer compartment would be the better solution for even cold distribution and more storage space. Some interior freezer compartments are not the full width of the mini fridge or are too small to accommodate a regular sized ice cube tray. It is always important to check the manufacturer’s specifications if freezer size is a real consideration of yours. 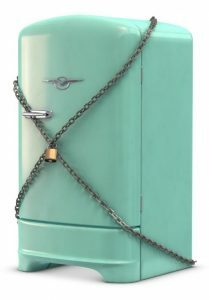 Traditionally, refrigerators worked by drawing air across the coils (those things on the back of the fridge) to stop the coils from over-heating. However, with compressed air technology, airflow is no longer required to cool the coils. Coolant, within the walls of the refrigerator, is pressurized and sent through the walls absorbing the heat as it returns to the compressor to be re-pressurized. A little bit like your heart moving the blood around your body, converting the old blood into fresh oxygenated blood. Due to this technological improvement, mini fridges can now be tucked away in the smallest of corners with none of the old over-heating concerns. The only drawback is that compressors require a bit more power. If efficiency is important, look for a mini fridge with an energy efficient logo such as one that reads Energy Star certified. You may also be eligible for an energy rebate depending on the legislation in your area. Some mini fridges come with hinges that can allow for the door to be opened either to the left or right, depending on the configuration of your space. 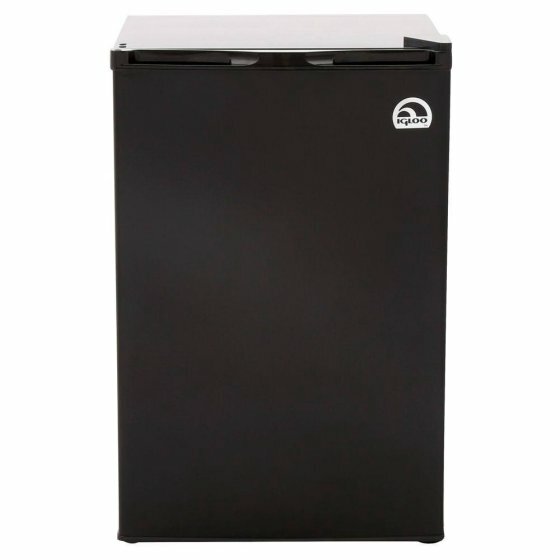 This may not be a consideration for the media room or garage, where the fridge is bound to stay in the same spot for years to come, but for dorm rooms or offices where moving is inevitable over time, having the option to choose to move the door can be a really convenient and cost effective feature. The locking door may seem a tad excessive to some but place some tasty treats in a high-traffic area such as a meeting room or dorm and you can see where a lock could come in handy. Some mini fridges are used for more serious purposes such as storing medications. In which case, a lock may be the only alternative to keep sensitive or dangerous materials out of the wrong hands. The locks are now installed by the manufacturers and are barely noticeable. Most even offer features such as automatically ejecting keys to prevent you from forgetting them in the lock. There are a few other features to consider when choosing the right mini fridge for you. Such as shelving, wire to keep clean in a dorm room, glass to prevent smaller items from falling. Do you want the shelves built into the mini fridge or easily removable? The finish, black, white, colored, stainless steel or even chalkboard are some of the options available today. There are door baskets or pop dispensers, bottle holders and crispers. All of which can enhance your experience by providing organization and convenience or just get in the way of stuffing as many frozen mini-pizzas as one mini fridge can possibly handle! 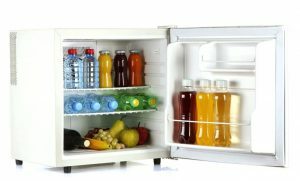 It is important to consider what you will be using your mini fridge for and the kinds of items you would like to store when comparing all these extra features. Camping & RV Generator – Which One is the Best? Couldn’t agree more, glass shelves are so much easier to clean. Also, doors look so much cooler and you know exactly what you have, you don’t need to constantly open the door. If you tend to keep your fridge less organized I would go for regular doors though, it keeps the mess out of sight. I was in a hurry so I bought mine on a whim and now I regret it. The shelves aren’t adjustable which makes it less practical and it forces me to keep a lot of stuff out just because there’s not enough height. I need a fridge for my dorm and to be honest I’m feeling a bit overwhelmed. A mini fridge size would fit perfectly in the nook right near my bunk bed, now I have to choose one that’s big enough and easy to clean as well. This is my first time shopping for appliances and these mini fridge prices took me by surprise. I was expecting these to be more expensive, especially the higher end ones. I will go for a basic, silver Black and Decker, it looks ok on paper. My mom advised me to go for a model that has a reversible door and boy, was she right! In my second year I had a much smaller corner for my fridge and this saved me from buying another one. Also, look out for standard mini fridge dimensions, some run on the bigger side and you might end up not having a place for it.